Healthy and so easy to make, this Mediterranean Quinoa Salad makes a perfect lunch or dinner. All the flavors of Mediterranean cuisine in one bowl! Start by boiling the quinoa in slightly salted water according to the package instructions (15-20 minutes). Once cooked, drain and let it cool. 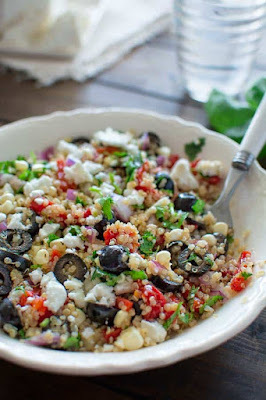 in a medium bowl, combine quinoa and the rest of the salad ingredients and pour the dressing on top. Mix everything gently and enjoy.